Standard battle rifle for the U.S. Armed Forces during World War 2 and Korean War. Fires in semi-auto (gas operating), feeding from stripper clips (a pieced of stamped metal which is expelled from the bolt with the last empty case), chambers the .30-06 ammunition. 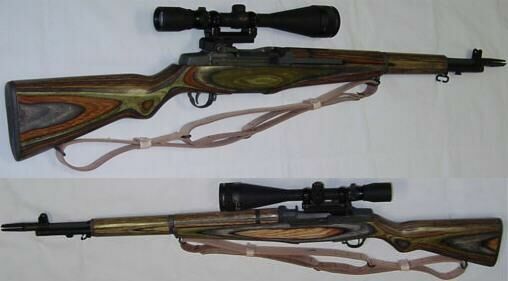 Here shown in "standard" dress and in "modern sniper" dress (with a modern 10x scope, AND a suppressor).